Rhinestone refers to the lead crystal stones imbedded in the molded plastic teeth. Teeth start as a liquid and are molded onto the zipper tape's corded edge. The slider is specially engineered to work with the corresponding teeth. 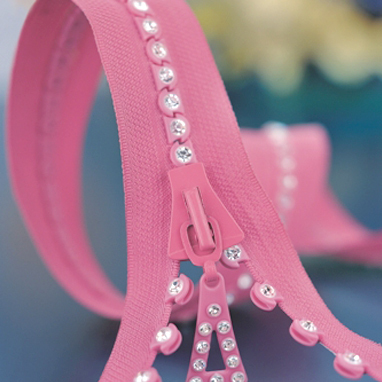 Rhinestone pulls are the finishing touch. Diamond-like...the "A" clarity lead crystal stones are imbedded into the plastic teeth – not just glued in. Always pre-test for launderability.